Having said that, Amazon is publicly pitching its iPhone app as being complementary to the Kindle rather than competing directly against it. And in some ways this is true. There’s a high degree of synergy between the Kindle experience on either device. 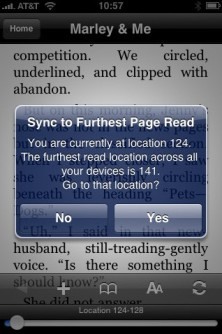 Using technology Amazon is calling Whispersync users can pick up reading where they left off from the Kindle to iPhone and vice versa. Additionally, since eBooks purchased through the Kindle store are kept on Amazon’s own servers, you can access any content from your existing Kindle library ‘over the air’ on the iPhone or iPod touch. However, aside from the Kindle’s superior e-ink screen technology, which is optimized for readability, there are a number of features that are missing from Amazon’s iPhone app. Most notable is the inability to browse and make purchases from the Kindle store directly within the app itself, instead you’ll need to fire up the iPhone’s web browser or make purchases first via a Kindle or desktop PC. Another omission, reports mocoNews, is access to newspapers, magazine and blog “subscriptions”, which due to copy-protection are currently tied to a single Kindle device.